As one of your constituents, I should be grateful if you would ask questions in Parliament re the Government's intentions in respect of preserving our life savings against the ravages of inflation. This is especially a matter of concern because of continuing enormous financial support for the banking system, here and in other countries (latterly Spain) that seems destined to burst out as high inflation at some future point. "The Prime Minister wants to ensure that the Government as a whole is giving the highest priority to addressing the cost of living." If this is so, why did National Savings & Investments withdraw Index-Linked Savings Certificates from sale on 19 July 2010, when they had previously been continuously available since 1975, a year in which RPI was 24.2%? Is this an indication that the Government expects RPI to be even worse than that figure in the intermediate future? And why were these Certificates, somewhat grudgingly reintroduced (5-year term only) on 12 May 2011, withdrawn again on 7 September? Why are they not available now? It is also worrying that the Government's 2011 Budget Plan (as given in Red Book Annexe B, page 90 - http://www.direct.gov.uk/prod_consum_dg/groups/dg_digitalassets/@dg/documents/digitalasset/dg_196165.pdf) says "National Savings and Investments (NS&I) is expected to make a contribution to net finance of £2 billion." 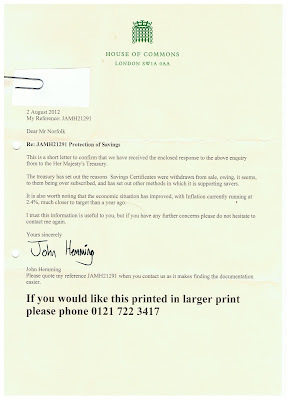 Is this a sign that the Government is purely concerned about targets for government borrowing and not at all exercised about the protection of HMG's subjects' money savings, which in many cases have been built up slowly and with difficulty over many years. Why should simple savers have to accept risks to the real value of their deferred spending, as though they were speculators? Is the Prime Minister's leaked pronouncement a misleading dog-whistle to the electorate, or is he really willing to put our money where his mouth is? I will write to the chancellor about this. 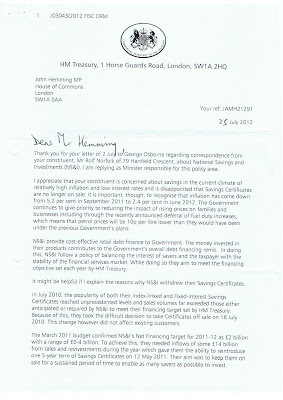 May I ask whether the Chancellor has responded on this matter, and if not, when and in what terms did you write to him? Surely he cannot disregard the issue? I will chase for a response. As you have now asked the Chancellor twice for a response on inflation-protected savings, without success, may I respectfully request that you table a Parliamentary question to be asked at the first available opportunity? No problem. The first opportunity will be in September. I will ask my researcher to work on drafting that with you. 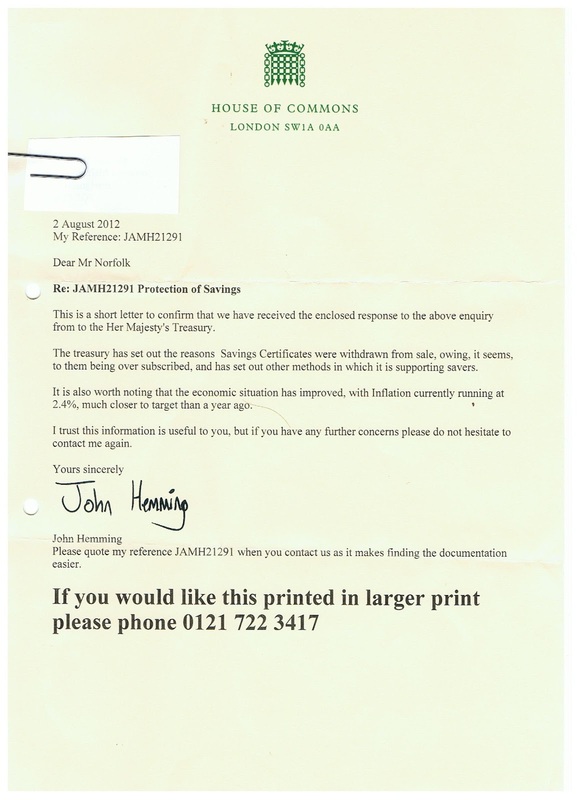 I was not contacted by Mr Hemming or his researcher re tabling a Parliamentary question. 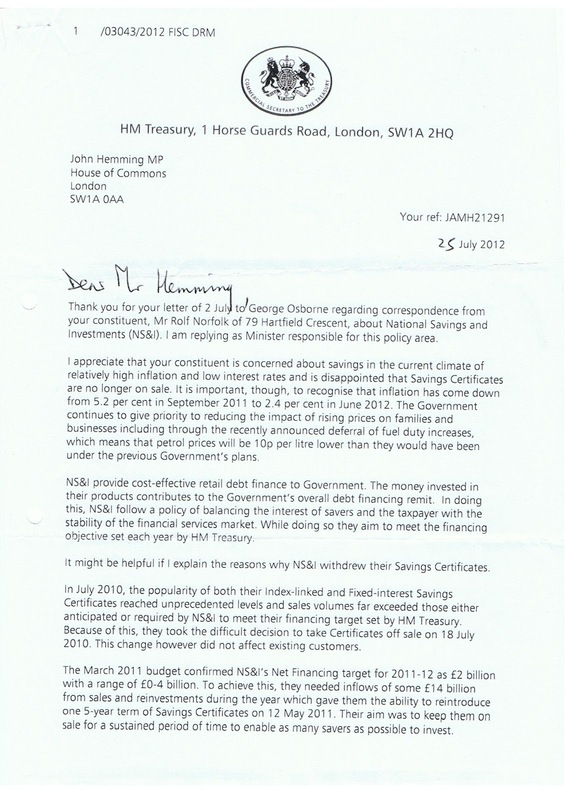 But Mr Hemming had wriiten on 2 July to the Chancellor, George Osborne, and on 4 August I received a copy of a letter (dated 25 July 2012) to Mr Hemming from the Commercial Secretary to the Treasury, Lord Sassoon. This is a short letter to confirm that we have received the enclosed response to the above enquiry from to the [sic] Her Majesty's Treasury. 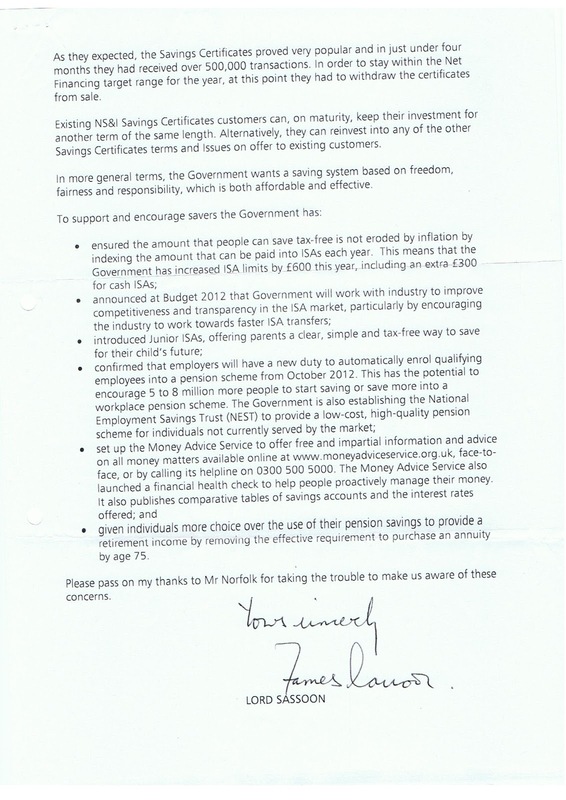 The treasury has set out the reasons Savings Certificates were withdran from sale, owing, it seems, to them being over subscribed, and has set out other methods in which it is supporting savers. It is also worth noting that the economic situation has improved, with Inflation currently running at 2.4%, much closer to target than a year ago. I trust this information is useful to you, but if you have any further concerns please do not hesitate to contact me again. Thank you for forwarding Lord Sassoon's letter, which arrived here yesterday. It is not at all up to the standard that I would expect from a Treasury mind; in fact, it is little short of a disgrace. Changes to the requirement to purchase an annuity at age 75, ditto. Sir, you have established something of a reputation as an MP who is prepared to ask awkward questions in Parliament, irrespective of party political aspects. This question is inconvenient to the present administration, but crucial to the financial wellbeing of many people throughout the country. I do not think it is ethical for the government to take the view that the man in the street must be forced to accept investment risk, merely when he decides to set aside some money for tomorrow instead of spending it today. His prudence should not be seen as an opportunity to shear his fleece with inflation. May I respectfully request that you take this further to PMQs or Questions to Ministers, and make a proper fuss? Parliament is not sitting at the moment. Thank you for your reply to my previous email. - may I ask you to pursue my query vigorously in Parliament? May I also draw your attention to two passages in Hansard from 1975 that make it perfectly clear that Government recognises the moral obligation to protect the value of savers' money? Does the Minister accept that the opportunity to invest in inflation-proof schemes is an act of belated social justice to millions of people who have seen their savings irreversibly damaged during the recent rapid rise in the rate of inflation? Will he make recompense to many of them by easing up on his vindictive attacks on the principle of savings embodied in the capital transfer tax and the wealth tax? The hon. Gentleman has put his supplementary question at the wrong time, because National Savings are rising very well at present. I am sure he will be delighted to hear that. As to what he called "belated social justice", I am sure he will pay due attention to the fact that the scheme was introduced by a Labour Government and not by a Conservative Government. Is the Chief Secretary confident that a further extension of index-linked schemes—which are welcome to savers—will not cause a diversion of funds away from deposits with building societies, leading to a rise in the mortgage interest rate? We are, indeed, aware of those problems. That is precisely why we introduced the scheme in this limited way. My Lords, does my noble friend agree that while the index-linked schemes are extremely good value for money, it would be a good idea—as inflation has been rather rampant—to increase the maximum amount that can be invested in them? On 22 July last year, you offered to allow me to work with your researcher to draft a Parliamentary question on this subject. May I ask whether that offer is still open? Andrew Oxlade on "Thatcher bonds"
James McKeigue on "Thatcher bonds"
Matthew Klein on "Thatcher bonds"
David Malone: Is Mali/Algeria terrorism permitted so banks can launder drugs money? $3.75 billion of ex-Washington Mutual mortgages "voidable"
Adair Turner (21 Nov 2011): "Debt and deleveraging: Long term and short term challenges"
James Howard Kunstler: Dow 1,000 by 2014, etc. Howard Gold: the markets are "structurally broken"
Nathan Martin: collapsing velocity of money in U.S.